Norient searches for contemporary music, sounds and noises from around the planet. We discuss current issues critically, from different perspectives, close to musicians and their networks. Through the Norient Online Magazine, the Norient Musikfilm Festival, performances, books, documentary films and radio programs we hope to orient and disorient readers, listeners and spectators. Find out about strong, fragile and challenging artistic positions in today’s fast moving globalized, digitized and urbanized world. Visit the website and you could be lost for weeks. Music, Film and some very interesting articles that I will try to repost here in the future. 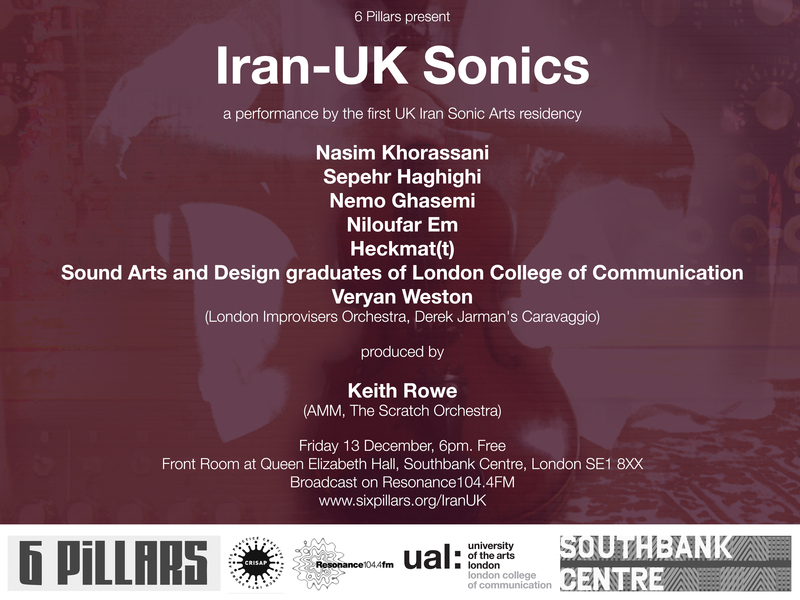 I have been following Six Pillars for a while as it covers all the arts from Iran and further afield. It was the doorway into discovering the importance of electronic music in Iran and subsequently, elsewhere in the World. Looks like a great Sonic event happening in December. Please support if you can. Six Pillars began as an audio-research adventure into arts and culture from Iran and its diaspora in 2005, and the website began in 2007. This weekly experimental radio show has since expanded over the years into performance events, residencies, art exhibitions, installations and an avant garde sound ensemble. Six Pillars’ focus has now progressed into West Asian, South Asian and North African arts and culture. it has taken its producers and collaborators to West Asia, Columbia and more. It has taken its listeners into anonymous bedrooms in Tehran and major art events and galleries around the world. Nominated for a Radio Academy Award in 2014, Six Pillars has an adaptive format and a pedagogical approach to programming, resulting in guest producers from a far afield as Malaysia, Iran and Egypt. Current broadcasts: Wednesdays 9-9.30pm, repeat Fridays 3.30-4pm. SoundGirls – Interesting articles here showing some other aspects of music production and engineering. Great site for challenging stereotypes and demonstrating the possibilities out there. It’s Monday reblog time and here is a recent post from Sounding Out in celebration of World Listening Day 2015. I have been following the work of Mendi and Keith Obadike for some time as their art looks in detail at Race and Sound in America. I will repost the previous piece above from SO! Amplifies – recommended. Courtesy to Sounding Out for this post.